I think my sweat is sweating – Where in the world is Kelly? After receiving a Fulbright grant, traveling thousands of miles, and essentially living the dream I have long since dreamt, I wish I had something more insightful to share. But my current reality is: it’s hot here. Like, really hot. All the time. Nonstop. Even after living in Florida for four years, I wouldn’t consider myself much of a sweat-er. But here in Indonesia? My pores have never had such a continuous workout! Even showering three times a day doesn’t feel like enough sometimes. Usually I can feel the first rivulet of sweat running down my lower back between 7 and 8:30 a.m. There is no A/C to be had pretty much anywhere except sometimes in cars, in offices of high-ranking people, and my bedroom in the evening. At the end of the day, before my final shower (which I just took, during which I made a rough mental outline of the content of this post) I feel like I just went swimming in the ocean. A taste-test of my shoulder pre-shower confirmed: lots of lost salts and electrolytes. But that’s enough talk about sweat. I went to not one but THREE weddings on Sunday, plus a bunch of other activities. Photos are loaded on Caitlin’s computer and are waiting to be loaded into Google Drive so that I can share them here. Today we received yet another wedding invitation for next weekend, this time for a teacher at my school. Apparently October is wedding season in Indonesia. Either that, or there are usually just lots of young people getting married on a regular basis. Some of my students working in small groups to unscramble a letter that I wrote. Lessons that require nothing more than paper, pen, and maybe a dry erase board are my preferred style of teaching in this country of uncertainty. I taught a total of three hours at school this week. Even that was not official class time because Ibu Isnaini, my co-teacher, was sick that day, so I was left to my own devices while another teacher (my grant stipulates that I cannot be alone in the classroom) sat in the back. For these classes, I wrote three incorrect sentences on the board that were modeled after sentences students wrote for me last week about their weekend plans. Example: “On Saterday I go to beach” became “On Saturday I will go to the beach.” I had students volunteer to come up and write corrections on the board. After each correction was made (and especially for the corrections that were incorrect) I provided an explanation for why the corrections were made. This was followed by practice with articles and then a speaking activity. This took an hour and a half. All in all, a successful class I think. But that was Tuesday. Monday I didn’t have class because I was invited to attend Drama Kolosal, a play that reenacts Indoenesia’s military history. Then Wednesday through Friday this week there is no class because there is a teacher training workshop that all teachers must attend. And I think mid-term tests are at my school next week, so I might not be teaching then either but I will prepare a lesson just in case. Welcome to Indonesia. After making several inquiries as to whether or not mail had arrived for me at school, a letter and a postcard mysteriously appeared on my desk. Thanks Mom and Dad! Good to know the Indonesian postal system works. 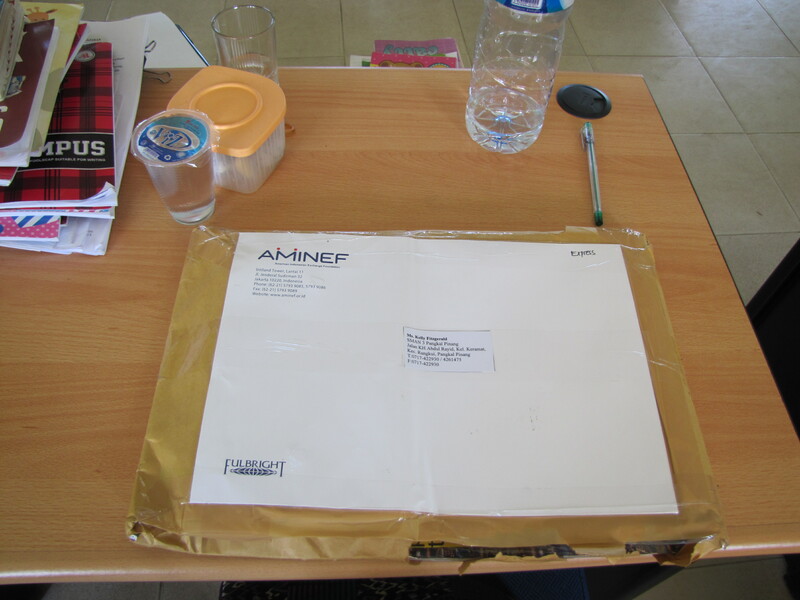 An envelope full of English teaching resources from AMINEF / the U.S. Embassy that arrived for me last month. Being vegetarian in Indonesia can be challenging, but it is by no means impossible. I eat a lot of rice every day as well as fruits like apples, mangos, and pineapple. Indonesians like spicy and sweet flavors (not usually together) but most of the spicy food has meat in it so I have tasted far more of the sweet side of Indonesian food. 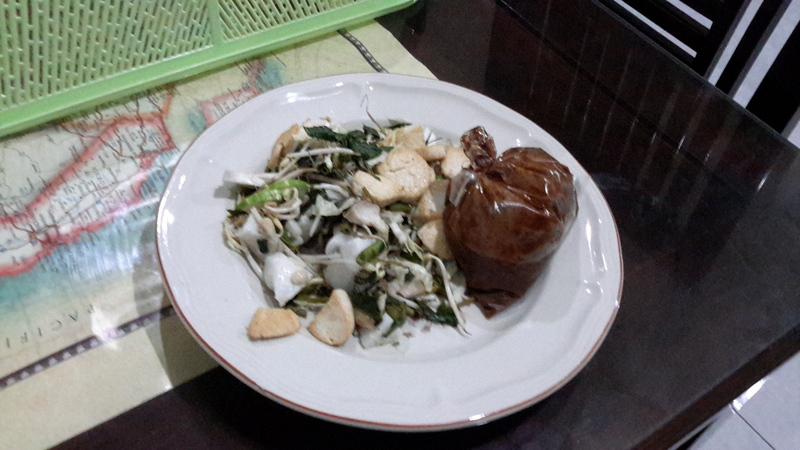 By far, my favorite Indonesian food is gado-gado / pecel / ketoprak / whatever other kind of dish is in that family. I want to learn how to make it so I can eat it always no matter where I’m at, but I have yet to find an Indonesian who is willing and able to teach me. 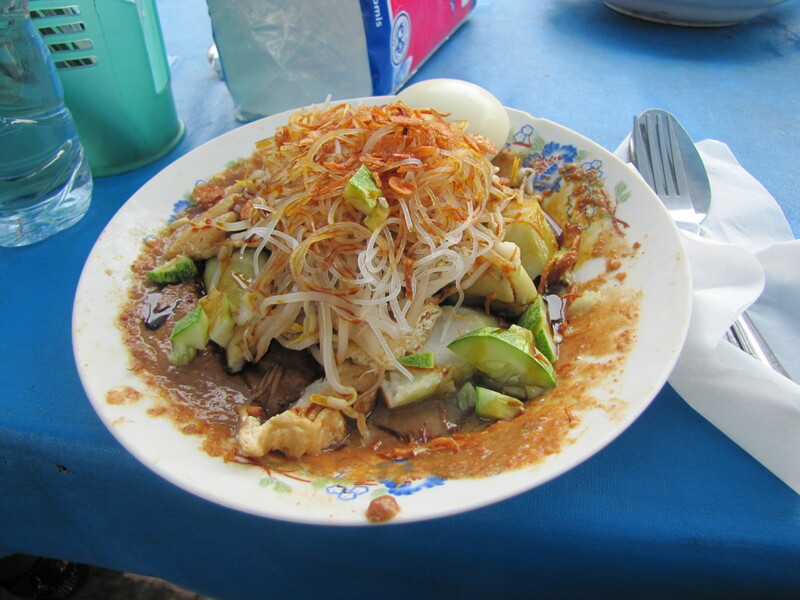 Ketoprak, an amazing mix of vegetables, hard boiled egg, tofu, noddles, fried onion, peanut sauce, and happiness. Gado-gado that was bought to go and eaten at home. The peanut sauce is on the side so you can see the mix of veggies and noodles and slices of compressed rice that make up the bulk of this dish. I fried tofu to add some protein. Wow it sounds super hot there. I would want to hibernate in the air conditioned bedroom! What a great teaching idea using the sentences. In the picture it appeared that the students were working on the assignment intently. I am certain that you will become a great teacher. Thanks for your comments. It is actually supposed to be the rainy season now, but lately the seasons have been changing here so there hasn’t been rain for maybe 6 months or more. I have been told that when the rains come all of the flora will explode in green. But for now, the war against the dust and the heat will continue.